Once your baby starts teething, they want to chomp down on anything and everything! And there’s no better way to help soothe their gums and bring them some relief than to give them some of the best teething toys you can find. When we were choosing the teething toys for our list, our top priority was safety. To that end, we sorted through tons of different types of baby teething toys so that we could present you with only the safest and best of the best. 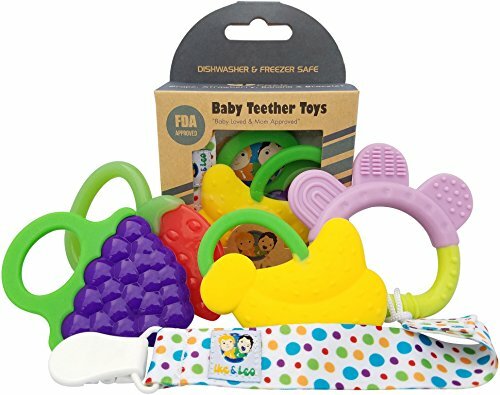 Whether you want a teether you can put in the freezer for some cool relief, or one you can put in the dishwasher for easy cleaning, we’ve got you covered. In addition to helping soothe your baby’s gums, the teething toys on our list will also help improve your little one’s grasping skills, as well as allow them to experience a wide variety of tactile sensations. And best of all, not only are the teethers on our list great for soothing your infant’s gums, they’re also lots of fun! These Silicone Sensory Teething Rings come in a pack of 4 and are soothing to your teething baby’s sore gums. You get 4 different color rings in this pack: green, yellow, pink, and blue. They’re Phthalate and BPA free and they come with a free teething book. Not only do these teething rings help sooth aching gums, but the ridges on them help your baby to develop their sense of touch. These rings are large enough that your child can hold them with both hands and chew on them and they’re also freezer and dishwasher safe. The different textures of the rings also help soothe sore gums and the rings are large enough that your baby can’t push them deep into their mouth. They’re very durable and once your infant is done teething, they might even enjoy throwing the and playing with the rings. Some toddlers even wear them as bracelets. 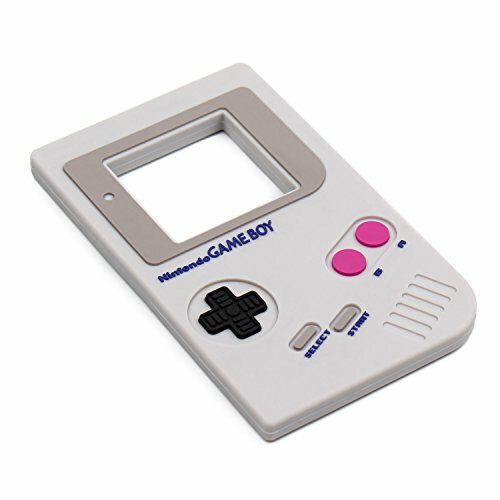 This cool Bumpkins Silicone Baby Teether Nintendo Game Boy looks just like the hand- held computer game! It’s made of 100% food grade material and is BPA, PVC, Phthalate and lead free. It’s easy to clean with soap and water and is dishwasher safe. top shelf only. This teether can be refrigerated or frozen for infants who find colder teethers more soothing and the back of this teether is textured to help massage your baby’s gums. It’s also flexible enough that it has a bit of give so when your baby chews on it, they get even more of a massaging action when they sink their gums into it. There’s a hole to make the teether easier for your baby to grasp and you can run a baby safe string through the center of the teether if you want to secure it to a crib, stroller, or car seat. This Bumpkins Silicone baby Nintendo Game Boy teether is a cute and useful teether for soothing your baby’s gums. Parents think it’s really cute! 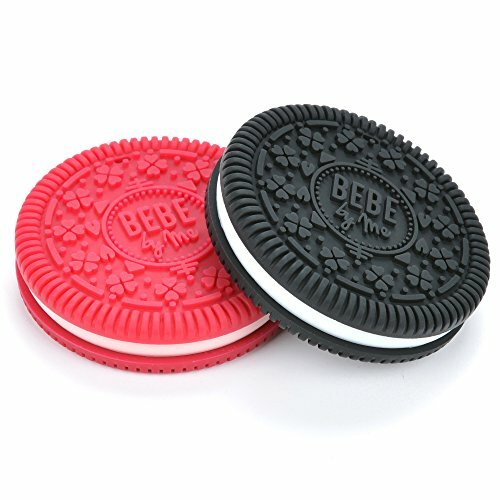 These yummy looking Bebe Cookie Teethers come as a set of two. One looks like a raspberry cookie and the other one looks like a chocolate Oreo cookie. The ridges and flowers on each cookie are a great way to massage and soothe your baby’s gums. Plus one cookie is hard and the other one is soft, giving your baby two textures to choose from. Made of medical grade silicone, these cookies are antimicrobial, Phthalate, latex, lead, BPA, PVC, and cadmium free. Each cookie comes with a lifetime guarantee and a detachable cord that has a safety breakaway clasp. The cords are ideal for attaching these teethers to your baby’s stroller or carrier. They can both go in the dishwasher so they’re easy to clean. And you can also freeze them to give your baby’s aching gums something cool to soothe them. These BeBe Cookie Teethers are cute, and easy for baby to hold and chew on and parents love that these teethers look like their baby is chewing on a real cookie. Parents like that one cookie is softer and one is harder so that their baby can choose which cookie feels more soothing. They’re antimicrobial, as well as Phthalate, latex, lead, BPA, PVC, and cadmium free. 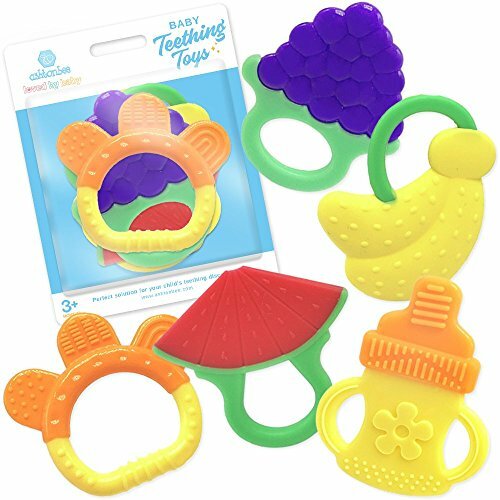 This cute set of Nuby Wacky Teething Rings is made of silicone and have a variety of textures to help massage and soothe your baby’s gums. 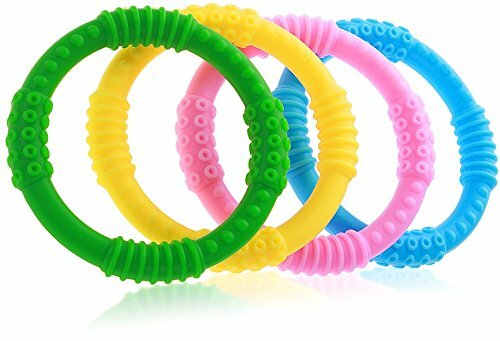 BPA free, these teething rings are colorful and easy to hold and the multiple surfaces are designed for breaking in your baby’s front, middle and back teeth. The fact that these teething rings have different surfaces all around it is sure to make a hit with most babies, as there’s something for everyone. The ring shape allows you to easily fasten them to a stroller, a car seat, or a swing so they don’t get lost should your infant drop them. Plus the bunny shaped ears make a crinkling sound when your baby squeezes them, which adds to the fun. The Nuby Wacky teething rings are easy for your baby to hold and make a great toy, so they’re sure to become a favorite. These adorable Ike & Leo Teething Toys come as a pack of 4 and are a real comfort to teething infants! Made of food grade silicone, these teethers are BPA, PVC, lead and Phthalate free. They’re freezer and dishwasher friendly and come with a convenient pacifier clip. Each of these teething toys have different textures so at least one of these teething are sure to soothe your baby’s gums and help their teeth break through. These teething toys are easy for baby to grasp and will massage their gums clear into the back without causing your child to gag. They come in a cute little box and the included pacifier clip is a handy addition to the set. Parents love that these teething toys are small enough to easily fit into a diaper bag, purse, or pocket so you can take them wherever you go. This 5 pack of Silicone Baby Teething Toys is made by Ashtonbee and is a great value, providing lots of fun and soothing gum relief for your baby. Made from medical grade silicone, these soft and textured teething toys are BPA and BPS free, non-toxic and very easy for your baby to grasp. Extremely cute and colorful, this set of teething toys features a watermelon, grapes, a banana, a bottle and an orange. Each toy has a different texture so your baby has their choice of which toy is the most soothing. Plus they’ll fit nicely into your baby’s mouth without posing a choking hazard. All the toys are both dishwasher and freezer friendly and they come with a lifetime warranty. Parents like that there are 5 different teething toys, allowing them to keep one in the diaper bag, clip one to the stroller, the high chair and other handy places. With this set, you’ll always have a teething toy on hand when your child needs one no matter where you are. These Ashtonbee set of 5 teething toys offers your baby the variety of textures that they need to sooth those aching gums when their teeth are coming through. These teething toys are made to prevent your child from gagging when using these teething toys. 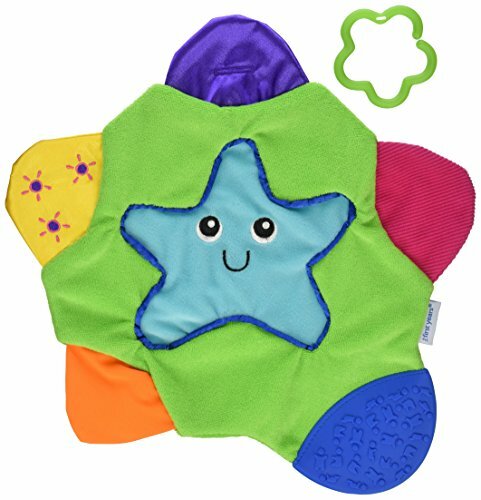 This First Years Star Teething Blanket is cute, colorful and fun! The entire blanket has soft textures that your baby will love exploring with their mouth and hands. Each point of the star has a different texture, including silicone, corduroy, satin, and other soft textures your baby will love chewing on. And to add to the fun, one point of the star crinkles, while another star point has a squeaker. This lightweight blanket is about one foot square and easy to grasp. There’s a removable loop that can be used to attach the blanket to your child’s car seat or stroller so that it doesn’t fall. Babies love the different textures of this teething blanket and because it’s so soft, it won’t hurt your baby should they roll on it or drop it on their face when using it. The blanket is extremely easy to wash. Although the directions state it should be hand washed, several parents said it did just fine when they washed the blanket in the washing machine on a gentle cycle and air dried it. Several parents said that their infant uses the blanket so much that they bought a second one so they could always have a clean one on hand. The First Years teething blanket is a great alternative for those babies who prefer to chew on cloth rather than teething toys made from other types of materials. 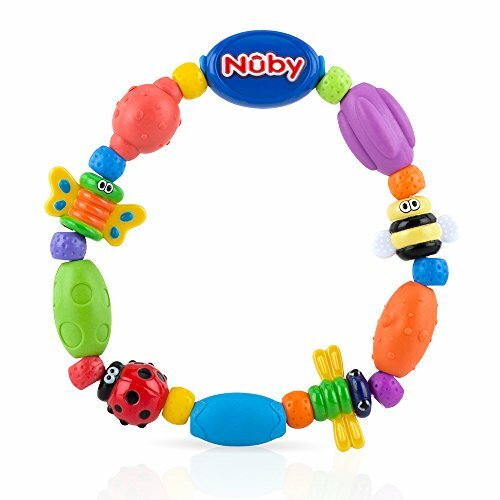 The Nuby Bug-A-Loop Teether is a ring-shaped teether consisting of colorful bugs and beads. Featuring a lady bug, a bee, a dragon fly, and a butterfly, the bugs and beads all have different textures that are soothing to your baby’s gums. It’s BPA free and lots of fun for babies to play with when they’re not gnawing away on it. Although it’s recommended that you not put the Bug-A-Loop in the dishwasher, it’s easy to keep clean by wiping it with a cloth. 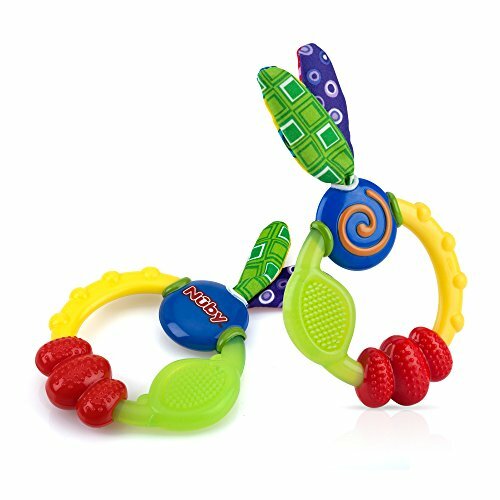 This cute teether is durable and the multiple textures will give your baby tactile stimulation as they explore the various bugs and beads with their mouth and hands. While this teether won’t freeze, it can be put into the freezer to get cold to help relieve the pain of your baby’s aching gums. This teething ring is best for infants who prefer chewing on harder rather than softer surfaces. It’s a fun teething ring for your baby to chew on and explore various textures. This brightly colored, cheerful teething ring is sure to really capture your baby’s attention! 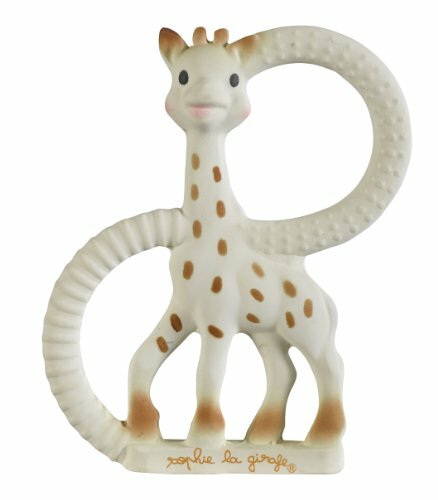 The Sophie La Girafe – So Pure Teether is a cute teething toy that both parents and love. This charming giraffe teether is made of 100% natural rubber and it has two attached rings, each with a different texture. One has ridges and the other one has bumps, allowing your little one to choose which texture they want to chomp on. The So Pure Teether is BPA, Latex, Phthalate, and lead free, plus it’s made with food grade paint to ensure it’s completely safe for your baby. Measuring 4.5″ X 3.5″, the So Pure Teether has lots of places for your baby to grasp and hold onto Sophie, helping improve their fine motor skills. Sophie can be put in the freezer for those babies who find more relief from gnawing on cold teethers, can be cleaned by simply wiping it with a damp cloth. This teether is easy to clean by wiping off with a damp cloth. Lil’ Teethers Baby Teething Toy. Bendable & Freezer friendly. The Lil’ Teethers Baby Teething Toy features an adorable little raccoon holding a nut. This teething toy is soft, chewy, freezer friendly, and can be attached to a pacifier clip to keep the teether from being lost. And because it comes in a natural beige color, it’s sure to match any nursery décor. While the front of this teether is fairly smooth, the backside is ideally textured to help soothe your baby’s aching gums. The hole in the center of the raccoon makes it easy for your infant to grasp and bring to their mouth. On top of being a great teether, this little raccoon also makes a fun toy for babies who are just beginning to explore their world. 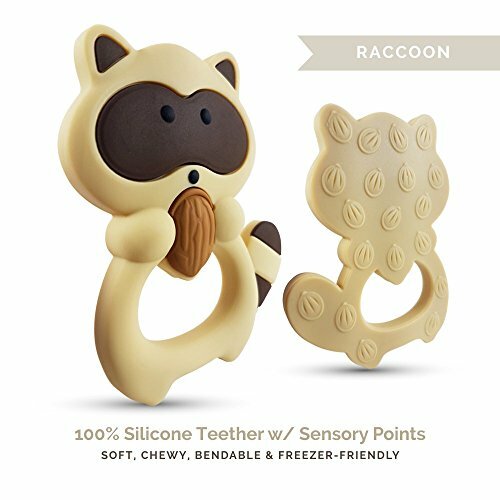 This Lil’ Teethers raccoon teething toys is a cute little teether that’s sure to soothe those sore gums when your baby is teething. The Bright Starts Snuggle Teether is an awesome combination of snuggle toy and teether! This cute little teething toy is comes as either an elephant or a giraffe. Unfortunately, at this time, there’s no way for you to choose which design you get when you order. But both are adorable and very easy for your baby to cuddle up to when they’re not chomping on them. Each animal is soft and cuddly, with a padded head and a flat body. The feet are textured so your baby can gnaw on them to help soothe their aching gums. As an added bonus, the belly of this Bright Starts teething toy crinkles, making it even more exciting for your little one. Made from non toxic material, the snuggle teether is BPA, Phthalate, and lead free. Although it’s recommended that you clean it with a damp cloth only, several parents said it did fine when they machine washed it on a gentle cycle and then air dried it. Parents like that this teether is lightweight and easy for their infant to grasp. And they love that it makes a comforting snuggle toy as well as a great teether. Cute and useful, the snuggle teether may become one of your baby’s favorite toys! Whether your baby gets the giraffe or the elephant, the snuggle teether is one of the cutest teethers around! 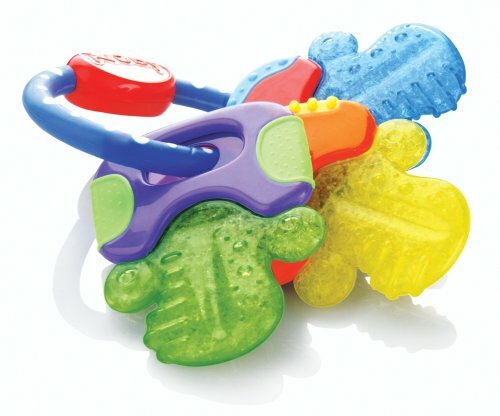 These Nuby Ice Gel Teether Keys are ideal for babies who find chilled teethers more soothing on their aching gums. different texture, making it easy for your baby to find a texture that’s soothing to their gums at any given time. Each key is filled with gel that will freeze if left in the freezer, which is great for babies who get more teething relief if they chomp on something cool. This teething toy is easy to grip and it’s BPA, Phthalate, PVC, and latex free. Due to the gel inside the keys, they can’t be boiled to sterilize so it’s recommended that they be cleaned using soap and water and then rinsed well. Babies like this teething toy because they not only is it soothing for their sore gums, but it’s also fun to play with. Parents like that these keys are durable and that their baby finds them soothing whether they’re chilled or at room temperature.